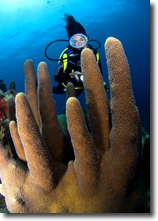 Why dive with us? watch this video here!!! Only $995 per person, based on 6 divers, includes 6 nights’ accommodations in a Luxury house with pool on Tortola, 5 days of 2 tanks dives (10 dives on 10 World-class sites), and two afternoon beach opportunities to visit our beautiful out-islands! April 27- Nov-15, 2014 ONLY, by Advanced Reservation. Subject to availability. When you Rent from Us, Delivery is Free! We've got top of the line, state of the art scuba equipment and we're also a full service scuba sporting goods dealer. Wetsuits, Reg's, BCD's, Tank Computers and more. What is an Eco-Tour. . .
Its our way of introducing you to the natural environment that makes the BVI such a special destination. You'll learn about weather patterns, migrating and nesting seabirds, the plant and animal life that exists here, local history, conservation efforts, fish feeding habits, and the miracle that is the living, coral reef! From uninhabited cays to pristine coral reefs, a half or full day Eco-tour will certainly be one of the highlights of your vacation! We Make Learning to Dive Fun! and taking a look at what's down there below? Scuba diving is the perfect sport for people of all ages. We cater to your experience level. Most dive operators put limitations on their entire boat of divers, treating them as an aggregate group and don’t respect or cater to your individual level of experience. For beginner and intermediate divers, our experienced Instructor and Divemaster guides will be happy to buddy up with you to make your experience more comfortable and safe. Get Your Wreck On. 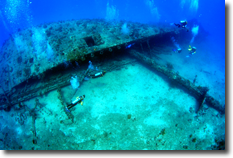 . .
With wreck sites like "Pirates Purchase" and the RMS Rhone, you'll want to explore all the history the BVI's have to offer above the water and below! © 2009 BVI Scuba Co. All rights reserved.